Even with the advent of ultra large TVs in the latest years, the 55-inch TV category still remains the most popular choice for the majority of buyers. If you want to join the army of proud owners of 55 inch TVs, read on to find out which are the best models available in 2019. The good news is that with the rapid development of new technologies, the best features of the high-end TVs from the past are now becoming available for the more affordable models as well. 55 inch TVs are perfectly sized for small and big homes because they are large enough to provide you with the perfect home theater experience and yet won’t take up an entire wall of your room. The 55” TVs are also much more affordable than the larger ones, and yet have most of the features which the latest and largest TV sets have. Most of the 55 inch TVs in 2019 support HDR, 4K and feature built-in smart services allowing you to access and stream watch your favorite online content or the media content from your phone or computer. The choice of the best 55 inch TV depends on what you are planning on using it for – whether you want to watch your favorite Blu-ray movies, stream your preferred shows, watch sports, play video games, or use it as a computer monitor. An important feature to consider is whether you prefer to invest in an OLED TV with amazing black levels and color or you prefer the bright LCD screen which is perfect for movies and HDR enabled video games. We tested more than 40 new 55 inch TVs since the beginning of 2019, and have come up with the ultimate list of the best 55” TVs for 2019 for you. Read on to see what we liked about them, and which features we wish could have been improved. Also, take a look at our buying tips and the features to look for when shopping for the best 55 inch TV for your needs and preferences. We picked the LG OLED 55B8 as our overall top choice for 55 inch TVs for 2019 for several very good reasons. First of all, this 4K OLED TV is a very versatile one. It performs perfectly in complete darkness thanks to the self-emissive technology which turns off or simply dims individual pixels to adjust to the lightness or darkness. The pixel dimming will illuminate each and every one of the 8.3 million pixels individually. The LG B8 also amazed us with its perfect black uniformity and an astounding contrast ratio. The 55 inch TV from LG provides a very wide angle of viewing which makes it perfect for any type of room and for all types of room layouts and sizes. The best part is that the image remains super accurate no matter which angle you are viewing it from. It ranked at the top when tested for watching movies, TV, sports, HDR movies and games, sports and as a PC monitor. When playing games and watching fast action movies and sports, we found nearly no motion blur to distract us from the perfect viewing experience. The design of the LG OLED B8 is very high-end, and will add sleekness and contemporary style to any décor. The stand is quite narrow, so it can fit just about any TV table. If you want to mount the TV on the wall, you don’t have to worry about the inputs – because everything you need is easily accessible on the side of the set. Thanks to the ultra-thin borders (0.39 inches), and its ultra-thin size (1.93 inches), your wall mounted TV will look picture perfect. The 4K OLED TV from LG runs cool, so you won’t have issues with overheating. If you are planning on using this TV in a very bright room, then you can rest assured that the light won’t ruin your viewing experience, thanks to the superb reflection handling. This 55 inch TV will upscale 480p, 720p, and 1080p content perfectly with no visible issues which means that you can enjoy your favorite DVDs, TV programs and Blu-ray movies in perfectly upscaled quality. The B8 LG OLED’s ThinQ AI technology has a built-in Google Assistant which will allow you to control it with your voice via the LG Magic Remote. It also works with Amazon Alexa devices. Thanks to the α7 Intelligent Processor, your 4K HDR content will be enhanced further to create a perfectly lifelike picture with superior sharpness, depth, and stunningly accurate colors. The 4K Cinema HDR support Dolby Vision, HDR10 and HLG and provides a scene-by-scene optimization and tone-mapping. The sound of this TV is also incredible and immersive thanks to the Dolby Atmos technology used which is similar to that used in modern movie theaters. The LG 4K OLED B8 has 4 HDMI, 3 USB, 1 composite in, 1 RF, 1 optical, 1 Ethernet inputs as well as a mini-jack and Audio Return Channel Support via HDMI. It has Wi-Fi, Wi-Fi Direct and Bluetooth connectivity options. The Smart TV runs WebOS v.4.0 and has a few preinstalled apps such as Netflix, YouTube, Amazon Video, and many more available for download at the LG content store. Overall, you will be amazed at the perfect picture, the amazing sound and the overall performance of this beautiful, sleek 55 inch OLED TV from LG! Plus, this bundle offers a complimentary $100 Hulu Plus gift card, a free wall mount, a backlit keyboard for the TV, a 6 outlet surge adapter as well as an extended 1-year warranty along with the TV! Even though the Samsung Q8FN doesn’t have the infinite contrast ration of our top pick – the LG OLED B8, this stunning 55 inch TV still performs perfectly well in dark rooms as well as in bright rooms thanks to the excellent reflection handling and high peak brightness feature. This TV by Samsung is also great for gaming, as it supports various new gaming technologies, including a variable refresh rate and auto low latency mode. The motion handling of this QLED TV, as well as its perfect response time, makes it great for watching sports and fast action movies and shows. Overall the 55” Samsung Q8FN has a very wide color gamut and is very responsive thanks to the low input lag. It is perfect watching for fast motion content and performs well in both dark and very bright rooms. The 360-degree view of the TV thanks to its bezel-less design makes it a superb accessory for any décor. You can mount it on the wall or enjoy it on its stand (9.7″ x 38.1″) without being distracted by any cables hanging out thanks to the Q Style cable management system. It can be used in ambient mode, which plays music, shows decorative content or show your own pictures straight from the cloud, which is another amazing feature of this 55 inch TV. It is a Smart TV with a Bixby Voice feature allowing you to quickly and easily find any content streaming or any favorite shows running via the One Remote and your voice at the Universal Guide provided by Samsung. You can connect it to your home network via the Wi-Fi or Ethernet connections available. The smart TV runs on Samsung’s Tizen and has a wide variety of apps to choose from. You can quickly and easily pair all your mobile devices via the SmartThings app to share content and control your TV via your smartphone. The powerful Q engine will optimize all kind of content to 4K quality and clarity, color and HDR. All of the inputs are located on the side of the TV frame. They include 4 HDMI, 2 USB, 1 Digital optical audio out, 1 tuner, and 1 Ethernet. The Samsung QN55Q8F TV is a perfect choice for all kinds of purposes, including watching movies, sports, playing games, HDR gaming and movie watching, and as a PC monitor. We can strongly recommend this beautiful TV to just about anybody who wants to upgrade their TV to a new 55-inch model from 2019. If our top picks for the best 55 inch TVs for 2019 are too expensive for you, we strongly recommend our top budget-friendly pick for this year – the TCL 55 R617 4K UHD Roku TV. It provides a stunning 4K HDR performance and features the Roku OS smart platform all at a shockingly low price. The TCL 55R617 has an attractive brushed metal design and will provide you with a superior TV experience. It supports Dolby Vision which delivers superb contrast and brightness and a very wide palette of rich and satisfying colors. Its Contrast Control Zone technology will optimize the image in 120 zones individually and the result is a striking contrast between the dark and light areas. This 55 inch TV from TCL is powered by an iPQ engine which provides precise color reproduction, and an HDR Pro Gamma system which improved the HDR performance significantly. Thanks to the smart Roku platform, you can easily connect to and access your Blue-ray player, cable box or gaming console without the need of flipping through the different inputs and fumbling through complicated menus. You can control the TCL R6 TV with your voice, which will make your viewing experience even more enjoyable and finding the perfect content among the 500,000 movies and TV series available on Roku TV much easier. The LED backlighting, full-array local dimming combined with the Zone controls will bring you an excellent picture with deep blacks and a very satisfying contrast even in the darkest rooms. The TCL R6 55 inch TV has 3 HMI 2.0, one HDMI ARC, 1 USB, an RF composite, a headphone jack, Optical audio out and 1 Ethernet inputs. The low impact lag is perfect for gamers, and the fast motion clearing function makes this TV excellent for enjoying sports and other fast action content. It is also superb if you want to play HDR games or watch HDR movies. 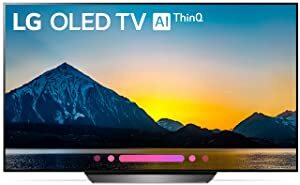 Overall, this is a very good quality smart 4K Ultra HD LED TV which is available at an outrageously low price, especially as compared to our other top picks for the best 55 inch TVs for 2019. Actually, it is the best 55 inch TV which you can buy in this price range right now! If you want the best 55-inch mid-range TV which you can alternatively use as a PC monitor and which also provides a superb gaming experience, you should go for the Vizio P-55 F1 4K HDR smart TV. Yes, we did pick another TCL 55 inch TV as our top budget pick for 2019, but if it is still out of your price range, you should consider buying the least expensive 55 inch TV on our list – the TCL 55S405 4K UHD Roku smart TV. If you are ready to invest in Sony’s last year flagship 55 inch TV, then you will be pleasantly surprised to find out that Sony has returned to OLED with the Sony XBR55A1E 4K Ultra HD Bravia OLED TV, and the truth is that this TV offers the best HD to 4K upscaling we have ever seen. So, you want to use your new 55 inch TV for gaming? The new Samsung UN55NU8000 has some amazing gaming features you don’t want to miss out on. If you like our top pick – the LG OLED55B8, you will absolutely love this upgraded version – the latest LG OLED55C8 55” 4K HDR TV. If you want a Sony 4K Ultra HD 55 inch TV, but aren’t ready to pay several thousand dollars for one, the mid-range Sony XBR-55X900F is a probably the best choice you have in 2019. The LG OLED55B7A 55 inch 4K Ultra HD TV may be from 2017, but it is still one of the best entry-level 4K OLED TV’s on the market today. If your home or your budget is too small for a 65 inch TV, the best way to go is to buy one of the amazing 55 inch TVs available at the market right now. 55 inches is the perfect size because it will provide you with an excellent viewing experience without taking up too much space and most of the wall space in your room. Plus, the prices of the good quality 4K 55 inch TVs are much more affordable than those of the 65 inch and larger ones. Most of the 55 inches on the market and all of the ones we have picked for you, support 4K Ultra HD resolution, have smart features and HDR. But still, choosing the best one for you could be quite a frustrating task. The most important factor, of course, is how much money you are ready to pay for your new home entertainment system. Also, you need to pick between the LCD and OLED panels. While OLEDs are thinner and provide cinema-level blacks, the LCD’s are usually cheaper and have unrivaled brightness which is an excellent feature when watching HDR movies or playing HDR games. Except in very rare cases, don’t expect a movie theater like sound, so get ready to buy a sound bar to complement the audio of your TV. Due to their thin designs, the manufacturers are making the speakers smaller. Well, we hope that our 55 inch TV buying guide has been of use to you. We truly believe that we have managed to encapsulate all of the best offers for TV sets of this size which are currently available on the market. We have added some budget-friendly entry-level models which actually are pretty good and will cost you just several hundred dollars. Of course, our top 10 best list also includes the best higher end models of 2019 and from last year which may cost more, but actually provide the quality they promise to provide. With the wide range of options and prices of the TVs included in our best 55 inch TV list for 2019, we think that everyone will find the right TV for their needs. No matter which one you pick, you will be flabbergasted at the quality of the picture and of the viewing and gaming experience these TVs provide, especially if you are moving up from a smaller TV set with lower resolution capabilities. So, go ahead and invest in a good quality 55 inch TV today, and enjoy the experience of having your own affordable and space-saving home theater experience! We are sure that you will be happy with your investment and that you will never consider moving back to a smaller TV without the 4K Ultra HD capabilities and excellent features of these wonderful TV sets. Good luck with your purchase, and we wish you many hours of amazing picture quality and an immersive watching or gaming experience with your new 55 inch TV!